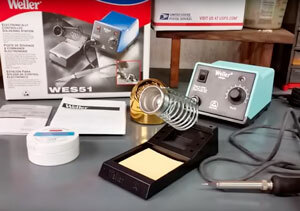 While the average person might get away with using a soldering iron here and there for their woodburning projects or to fix the odd component, those who frequently solder need a good soldering station. If you’re one of the latter, getting the best soldering iron station for the money is paramount. Here’s what we recommend. 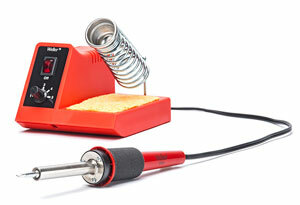 Soldering Iron vs. Soldering Iron Station – What’s the difference? When should I replace the soldering iron tip? How do I maintain my soldering iron tip? How do I clean a soldering iron tip? What other soldering iron accessories do I need? This station is packed full of features for the best possible experience, starting with its 75 Watt soldering iron. Featuring an ergonomic grip and temperature range of 392 to 896 degrees, the iron can easily handle most tasks. Both the iron and solder roll have their own holders, and a brass tip cleaner, cleaning flux, and sponge are all nestled into the base. The blue LED can switch between Fahrenheit and Celsius, and includes a 10-minute sleep timer and auto cool-down feature. The entire station is covered by a 30-day money back guarantee and 3-year 100% repair guarantee to ensure this tool remains in top working order for years to come. Owners are very pleased with the quick heating times and sleep feature. They love the fact that it has a resting temperature of about 200 degrees, but quickly reheats the moment you pick it back up. In the event of a burnout or other problem, users note that customer service is quick to remedy the problem and sometimes even ship spare parts at no charge. There are two possible issues with this station, both in relation to the iron itself. The first issue occurs after frequent use. A plastic collar that connects between the rod and handle has been known to deform and require replacement in a few cases. Also, using the iron at extreme temperatures for long periods frequently can damage the heating element, preventing the iron from reaching high temperatures in future. The heating elements can be replaced, however, and you can order additional ones inexpensively from the manufacturer. 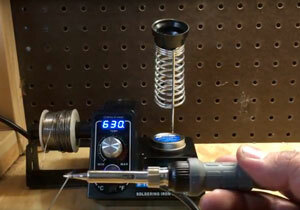 This analog soldering station is designed for those who frequently need to solder a large number of items. The included iron is a slim PES51 soldering pencil with durable Nichrome-wound stainless steel heating element and full compatibility with the Weller ET series tips. An electrostatic discharge (ESD) plastic handle, foam sleeve, and non-burning silicone rubber cord help ensure you can work for long hours safely and with less fatigue. The station itself has a stand for holding the pencil when you don’t want to and a sponge. In addition, the stations electronic control system can adjust between temperatures of 350 and 850 degrees Fahrenheit quickly and provides excellent temperature recovery. To prevent accidentally damaging electronics, jewelry, or other fragile components, the system also has a wireless temperature lockout that won’t allow you to set the temperature beyond the recommended max for a specific work piece. With an auto shut-off after 99 minutes of idling and easy-to-see LED indicator, this is arguably the best soldering iron station for any work environment. One of the most unusual perks about owning this tool isn’t the tool itself, but the manual. Chock full of diagrams and a full guide on servicing and repair, the manual has allowed most owners to diagnose and repair problems on their own. Owners of this station also love the quick heating and easy clean-up this model provides. Quite a few have noted that they purchased this stand to replace their aging Radio Shack irons, which were reliable but now as hard to find as the store itself. Weller has been a staple for decades, but many consumers have found the quality has decreased since the Weller company was purchased by Apex. Customer service could use improvement but seems to be getting better. It’s been noted by a few that the heat sensor within the pencil has a habit of burning out over time. This renders the entire unit unusable until the soldering pencil is replaced. As the pencil costs approximately half the cost of a new unit and uses specialized tips, many owners of this product have been reluctant to replace the damaged part. Fortunately, this is not a common occurrence. Another Weller analog model, this adjustable 5 to 40-watt station provides both accuracy and power to any project. The lightweight pencil has a certified ST3 iron-plated copper tip, cushioned foam grip, and replaceable heating element. The base includes a build-in stand, natural sponge tip cleaning pad, and power-on indicator light to warn you that you left the iron on. This model is compatible with all ST series tips and UL-listed to ensure it meets safety standards. A one-year manufacturer’s defect warranty is included. 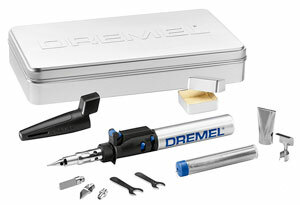 This is an excellent station for those who work on smaller projects, such as jewelry or circuit boards. Many owners have been long-time Weller enthusiasts, while others are first-time buyers. In both cases, they note that this station is easy to use and generally high quality. The ability to heat up to 900 degrees also makes this an extremely powerful tool when high heat is needed. There have been a few issues with temperature control on this model, as there is no temperature display present. Several consumers also have reported they received visibly refurbished irons so you want to make sure you’re purchasing from a reputable seller. Most of the complaints appear to be after Weller was bought out, so it might be wise to check the manufacturing date before purchasing to ensure you get the best quality. The number one name in hobby tools enters our list with this 14-piece precision butane soldering torch kit. This iron can perform a wide variety of functions, including burning, cutting, heating, shrinking, and welding. Highly accurate, this tool is perfect for detail and hobby work with the added bonus of being portable. A self-ignition button eliminates the need for an external igniter, and the tank holds enough butane for 75 minutes of continual use. The kit includes a deflector, case, cutting knife, hot air tip, protective cap, shaping knife, solder, soldering tip, sponge, tins, wide blower tip, wrenches, and Versa Tip tool. While a master of none, the high versatility of this tool makes it a winner with many hobbyists. They note the higher precision available and portability as key features. While it is not shipped with a butane already in it, you can buy butane refills at Amazon, Walmart, Home Depot, Michaels, and many grocery stores. Refilling it is super easy. Replacing the tips on this iron can be a pain, as Dremel doesn’t offer them in US stores. You will have to go directly through their service department, which can take some time to ship. Additionally, a lot of owners have complained about the storage case, which has a cheap plastic lining and doesn’t latch, making it a bit more difficult to securely tote this kit around. 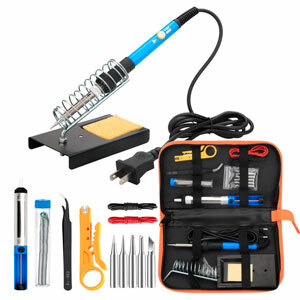 This professional soldering kit is perfect for everything from simple tasks to repairing car wiring and other heavy-use connections. The support station not only has a dual spring iron holder, but also includes a secure base and sponge for higher safety and efficiency. A metal desoldering pump can be used one-handed for removing solder from PCB, while the iron itself comes with five replacement tips and ability to quickly heat to temperatures between 392 and 842 degrees Fahrenheit. The smaller size of this iron and its adjustable temperatures are a big hit for both large and small scale hobbyists. They report success with everything from car audio cables to jewelry and even wood burning. The included desoldering pump is another popular feature, with even experienced solderers expressing how useful the tool is when needed. 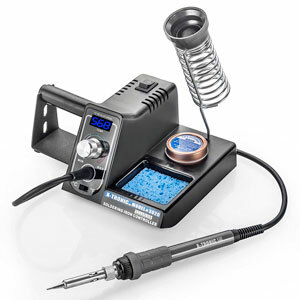 This is a great cheap soldering kit for beginners or infrequent users but the quality is not quite up to par of the soldering stations above. In a few cases, the heating element began to fail after a short number of uses. While a good value for the money especially if you’re just getting started with soldering, you’ll most likely want to upgrade to a better product as you gain experience or your budget allows. The following are some common sticking points for beginning hobbyists looking to improve their soldering skills. The most visible difference is also the biggest. 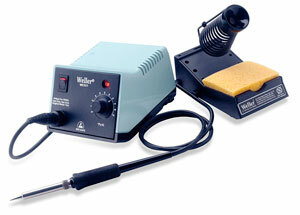 A soldering iron station is designed to hold your iron and includes spaces for a cleaning sponge and solder. The station can also regulate your iron’s temperature, allowing for a much wider range of projects and materials. When bought as a single unit, a soldering iron will include a small stand and may include a tube of solder. Everything else must be purchased separately, and the iron rarely has temperature settings. There are two schools of thought on this one. The first (and least helpful) is to replace a cheaper tip as often as once per month. However, properly maintaining the tip (see below) will negate the need for this. The purplish tint that forms on the inside is normal and will not harm your iron. A more precise answer is that you should replace a tip once the iron plating has been breached. Proper care will allow the tip to last for a long time, sometimes even several years. Unfortunately, once the coating is breached, the tip will fail. It’s very important to take care of your tips, especially the more expensive ones. This is actually rather easy and you may soon find it becomes habit. The first step is to tin your tips. Instructions for doing this will usually be included in your instruction manual. Next, use a cleaning sponge so that the tip doesn’t stay dry during a project. Dry heat will damage the tip a lot faster, so be sure to make good use of the sponge to wipe before adding more solder. Finally, leave the solder on. This may sound counter-intuitive, but cleaning your iron and adding fresh solder each time your remove the iron from its holder, as well as putting a final bit of solder on before turning the iron off will greatly extend the lifespan of your tips. The reason for this is simple: when you heat up the iron, it will melt the solder and the contained moisture will be enough to keep the tip from being damaged from excess heat. Depending upon whether you bought the iron alone, in a kit, or as part of a soldering station, this answer may vary greatly. As a general rule, you should have a cleaning sponge, rosin, solder, spare tips (some are designed for specific functions), a stand, and a heat sink. Some other good accessories to have are a desoldering pump for when you make a mistake and wiring harnesses for when you need to extend wires. The latter is safer than simply soldering the two wires together and can make complex projects much easier when used in conjunction with a good soldering iron.